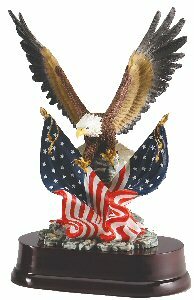 A great way to show some patriotism with this full color eagle sculpture. This resin award measures at 11" tall with a 7" wing span. Three lines of free engraving on a gold plate is included to make this award special.